Each season American Idol delivers on a promise whose epic scope is unparalleled in the annals of competition: to take an unknown dreamer from the middle of America and turn him or her into a genuine star. It has become not only the biggest show on television, but the biggest force in all of entertainment; its alumni dominate the recording charts and Broadway, win Academy Awards, and sweep up Grammys. 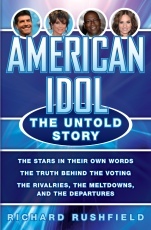 In fact, American Idol has reshaped the very idea of celebrity. But it didn't start out that way. When the little singing contest debuted as a summer replacement on the U.S. airwaves, it was packed between reruns and low-cost filler. The promise that it would find America's next pop star produced a hearty round of guffaws from the country's media critics. Now, some ten years and millions of records later, no one is laughing. American Idol: The Untold Story chronicles the triumphs and travails, the harrowing backstage drama and the nail-biting onstage battles that built this revolutionary show. In this revealing book, veteran journalist Richard Rushfield goes deeper inside the circus than any reporter ever has. Candid interviews with Idol alumni, including Simon Fuller and Simon Cowell, shed new light on the show that changed the entertainment industry. Rushfield has had full access to the people who created American Idol, starred in it, and kept it atop the pop culture pyramid. This is the first book to take Americans behind the curtain and tell what has really been happening on the world's most watched and speculated-about stage.